TOFU MOM . . . and gravy! : Taco Salad with Raw Taco "Meat"
Taco Salad with Raw Taco "Meat"
Today is just WAY too hot to cook what I had planned. And on careful examination, my refrigerator and garden revealed JUST enough ingredients to conjure up a fairly decent taco salad. I was particularly inspired to make this after seeing friends' pictures of a trip to Portland and a "live" taco salad from Blossoming Lotus. SO YUM! This raw option worked perfectly, since I had no beans or TVP already cooked for taco "meat", and no desire to cook any in this heat, I pulled out a recipe I invented (by combining a whole bunch of internet ideas) ages ago, in an attempt to copy the filling for the first raw dish I ever tasted (other than a green salad or something!) a raw taco at Seattle's Chaco Canyon restaurant. Really, why don't I make this more often? Don't let the "raw" word intimidate you. Seriously. Don't worry. I'm not big into the whole "raw foods" movement, in fact sometimes I think it's a little silly, (don't hate me, all you raw foodie people!) but I won't deny the occasional raw-ish recipe can be very tasty and a great way to use ingredients in a different manner, even if I'm not running out to buy a spiralizer or taking great pains to make sure EVERY minor ingredient is indeed raw!! (Is salt raw? Sugar? I have no idea and can't be bothered to find out). And, if you use plain old corn chips, like I did, the salad isn't actually all "raw" anyway. Who cares. It tastes good! Enjoy. Taco Salad When It's Too Hot To Cook!!! Mix all ingredients well and check for taste, you will want it to be a bit on the salty side. This is good to eat as is, but the real secret to it being "meaty" is to warm slightly in your dehydrator or low, low oven for just a little while so the mushrooms start to release some liquid. VERY YUM!! After the "taco meat" is mixed up, set aside or "warm" slightly, stirring every now and then. Make a green salad: toss your choice of salad greens with lots of chopped tomatoes, onions, chopped red bell pepper, jalapeno if desired and, most important, fresh cilantro. Blend above ingredients in the food processor, adding water, if necessary to make "dressing" consistency. 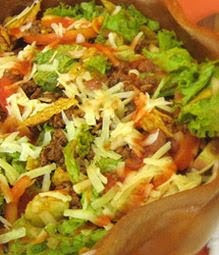 Sprinkle taco "meat" and crushed taco chips (if desired) on salad, toss to combine, drizzle with dressing, serve and enjoy! This sounds delish! I am always on the hunt for cold dishes that I can serve on hot days. Thanks. What a "cool" idea! It does sound very tasty. I'm with you on the raw thing. (don't hate me either raw foodists reading this). We're having one of the stickiest summers on record here, so having a "cool" meal is perfect. Made this for dinner tonight and it turned out really good. I did not really like the flavor of the "meat" alot on its on but when you put it all together it was really good! My daughter did not even know it was made from mushrooms. I added some extra cumin and chili powder to mine.